A proposal backed by a number of gun control groups that would expand the list of crimes that trigger an automatic 10-year ban on gun possession is moving through the Senate. The bill, backed by a lawmaker who helped write last year’s Gun Violence Restraining Order legislation, would add such crimes as selling ammunition to someone under the age of 21 to current ones that mandate a ban on gun ownership and purchases for a decade. Introduced in April, it passed the Senate by a 24-15 vote and is now winding its way through the Assembly. The measure’s sponsor is Sen. Hannah-Beth Jackson, D-Santa Barbara, who contends it will help stop future gun crimes. Transferring a handgun without a firearms license. Selling or giving possession of ammunition to a minor. Selling handgun ammunition to a person under 21 years of age. Possession of ammunition by a person prohibited from possessing a firearm. Furnishing ammunition to a person prohibited from possessing ammunition. Carrying ammunition onto school grounds. Receiving stolen property consisting of a firearm. Carrying a loaded or concealed weapon if the person has been previously convicted of a drug charges. Possession of a firearm that is not registered. “This bill helps keep guns out of the hands of those who shouldn’t have them and keeps our communities safer,” said Jackson. The legislation is supported by the Santa Barbara Police Department, the Los Angeles County Professional Peace Officers Association and other law enforcement groups as well as the Brady Campaign to Prevent Gun Violence and Coalition Against Gun Violence. In opposition are the National Rifle Association and its state affiliate, the California Rifle and Pistol Association who contend the move is overly broad. “The addition of these misdemeanor offenses to the prohibited category list that include the ‘transfer’ of firearms or ammunition could entrap family members who are giving firearms to relatives and are unaware of the requirements for firearm transfers through licensed dealers,” reads an alert from the NRA’s Institute for Legislative Action. Jackson’s bill is scheduled to be heard Wednesday by the Assembly Committee on Appropriations. The constitutional republic once known as The United States of America was conquered long ago and very few people even noticed. 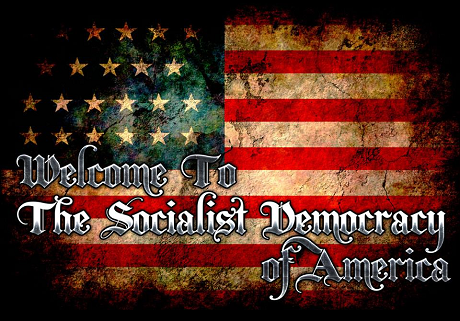 The US of A today has devolved into a socialist democracy bent on self-destruction. Stop and think for a minute, when was the last time you heard a politician, media talking head or ANYONE in any “official capacity” refer to America or her form of government as a “constitutional republic?” On the other hand, I doubt any one of you could even begin to count the number of times you have heard it referred to as a “democracy.” Democracy, defending democracy, spreading democracy around the world, democracy, democracy, democracy… Do you know what our founders thought of democracy? Well, to begin with you will NOT find the word democracy, democratic or any other variation of the word in either the Declaration of Independence or the United States Constitution. Not even an honorable mention or a participation ribbon. What did they say about “democracy” outside of those founding documents? One of the most famous quotes is “Democracy is two wolves and a lamb voting on what to have for lunch. Liberty is a well-armed lamb contesting the vote!” ~ Benjamin Franklin. While old Ben had a colorful way of expressing it, others shared his distaste for the concept. “Hence it is that democracies have ever been spectacles of turbulence and contention; have ever been found incompatible with personal security or the rights of property; and in general have been as short in their lives as they have been violent in their deaths… A republic, by which I mean a government in which a scheme of representation takes place, opens a different prospect and promises the cure for which we are seeking.” James Madison [Federalist Papers No. 10 – 1787]. Now, before you start throwing out phrases like “democratic republic” or “constitutional democracy” or “representative democracy” or some other concoction to cloud the issue, a CONSTITUTION and a DEMOCRACY are mutually exclusive. A constitution is a set “law of the land” with defined powers and rights. Our representatives are democratically elected to represent us WITHIN THE CONFINES of constitutional law, not mere public opinion. Changes to that “law of the land” can only be made by super-majorities of both the people AND the states. Even the Presidential election is not purely democratic, while the people do vote and the “popular vote” is counted, it is also balanced through the electoral college to insure that high population urban centers do not dominate the election while low population rural areas are left without representation. This insures that The President represents the WHOLE country and not just the few large cities of each state. Originally, US Senators were intended to be the voice of the STATES and the House of Representatives were the voice of THE PEOPLE. The passage of the 17th amendment was a MAJOR STEP AWAY from our constitutional republic and towards democracy by taking away the states’ voice and giving the people both houses of Congress based solely on popularity rather than states’ issues. Now there are those who call for the abolishment of the electoral college as well, which would for all intents and purposes complete that transformation. In a true DEMOCRACY there is no “law of the land” anymore, there is only the ever changing landscape of public opinion. Constant change and turmoil based on the hopes and whims of 50% + 1 of the population where RIGHTS no long exist for anyone, especially the minority, but privileges abound for the majority. This really hit home for me as I was engaged in and following the debates regarding Open Carry in Texas. I heard over and over again that there was not sufficient “public support” for constitutional carry, so the best they could do is to expand the privileges of the very few CHL holders, who PAY to exercise their natural rights, to include the ability to open carry. It was, and still is, often argued that we lost the right a little at a time, incrementally, and that is the best or only way to get it back. That is a socialist-democratic thought process pure and simple. To think that we must restore natural rights a little at a time so as to build public support or avoid public outrage is, well outrageous. Our transition from republic to democracy has indeed happened incrementally over time in order to avoid detection of the destruction of our sovereign rights. To restore those rights that are already constitutionally protected does NOT require a democratic majority, public support or any other incarnation of democracy. Just after the completion and signing of the Constitution, in reply to a woman’s inquiry as to the type of government the Founders had created, Benjamin Franklin said, “A Republic, if you can keep it.” WE HAVE NOT KEPT IT! Nothing in society will belong to anyone, either as a personal possession or as capital goods, except the things for which the person has immediate use, for either his needs, his pleasures, or his daily work. Every citizen will be a public man, sustained by, supported by, and occupied at the public expense. Every citizen will make his particular contribution to the activities of the community according to his capacity, his talent and his age; it is on this basis that his duties will be determined, in conformity with the distributive laws. While we do still cling to some of the trappings of free society and free markets, it is increasingly becoming more socialized. You do not “own” property, even if your house or land is paid off, you still lease it from the government through property taxes. Stop paying the taxes and see how long you “own” your property. Public schools and universities increasingly teach our children that they are “citizens of the world” and denounce individualism through group think such as political correctness. What was once embraced as self-evident truths have been dissolved in a sea of collectivist thought and propaganda. Life is no longer a sacred right, at least not if you are as yet unborn or a military veteran seeking the care that was promised them for serving their nation. Liberty has become an antiquated idea because people cannot be trusted to exercise it in a manner that is agreeable to all, or at least that is the subtext behind the socialization and reliance upon government regulation. The pursuit of happiness, which was meant be long term happiness as in property, opportunity and security has given way to instant gratification and hedonism. The more socialized we become, the less civil society becomes. The more democratic we become, the more divided we become. We split up into groups battling each other for what we want and the majority wins, whether their position is good for the nation or even state, the city or the individual is irrelevant. Mob Rule, winner take all and since the “have nots” will always outnumber the more productive and industrious “haves” then “democracy” works in their favor. Everyone imagines that the bottom 99% will be raised to the level of the upper 1%, but the reality is that the upper 99% will be lowered to the level of the lowest 1%. True “equality can only be achieved mathematically and socially at the lowest common denominator. At first it looks great. take from the rich and give to the poor in true Robin Hood fashion, there is just one problem.